New Delhi: The 10th Medtech Conference of Confederation of Indian Industries (CII) witnessed the coming together of officials from the Central and State government, stalwarts from the medical technology sector and thought leaders from across the globe to deliberate and network on how to best capitalize on the opportunities, given the regulatory environment and challenges faced by the Indian medtech industry. Held on 7th September at New Delhi, the conference set the platform for dignitaries to put forth their recommendations to the Government on various aspects such as Funding the medtech sector, Assessing role of Make-in-India for medical technologies, strengthening medical device policy framework, importance of preventive health, government initiatives and new technologies for early detection of diseases and moving towards value based healthcare. Thought leaders from across sectors including Anupriya Singh Patel, Minister of State for Health, Govt. 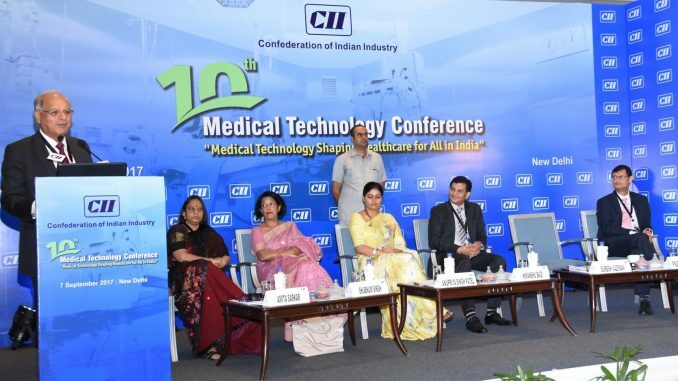 of India, Chandrajit Banerjee, Director General, CII, Himanshu Baid, Managing Director, Polymedicure Ltd., Dr. Naresh Trehan, Chairman, CII Healthcare Council & CMD, Medanta – The Medicity, Mr. Prabal Chakraborty, Vice President & Managing Director, Boston Scientific India Pvt. Ltd. amongst others shared the platform with Mr. Vazirani on putting forth their recommendations to the Government.